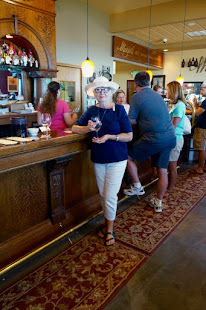 RETIRE IN STYLE BLOG: Scholls, Oregon: It's berry season...the best day trip you can make! Scholls, Oregon: It's berry season...the best day trip you can make! My life is SOOOOO good! The parents looked a little askance at me when I said I was taking the boys to the blue berry patch. The trip involved moving the car seats from their car to mine and then it involved me actually buckling them into the car seats when we got ready to leave. I know it seemed unlikely that I could actually do that. Those car seats are so maddeningly impossible! Then there was the question about whether the boys would be able to indure time in the sun, walking a long ways and avoiding the thorny black berries that grew in the the blue berry garden. Were those little people durable enough to do that very thing? Well, it turns out the answer is yes. They can pick berries, walk a long ways, and come home with only a few spots of sunburn on the places we missed with the spray on lotion. It turned out they might be better at picking black berries than I am. The bucket of "blue blues" were the best toy they had ever had. They pretended to pick and counted the good ones, imagined there were bugs in the bottom. All that good guy stuff. All in all I would not hesitate to take those little guys anywhere. Now we get to the part where I got them buckled in...this country girl was not raised to be dumb. My daughter came along with the two little girl grandchildren. She could buckle an alligator in...she makes me so proud. It was fun so I just thought I would let you know...it is Blue Berry season in Oregon! There is a little restaurant in an old hotel at the right in Scholls...remember this little place is just a wide place in the road. There is a nursery just across the road that had beautiful plants and baskets. You should go because it is a beautiful drive. One more reason to be grateful that I live in Oregon! I love berries and eat them every single day. On the Island we're almost there too! For me the joy is in the adventure and then seeing all those jars of frozen jam. They are so beautiful. Galen I hope your trip to the mountain was relaxing. I know it is beautiful. Shelley. Good to know you are reading.